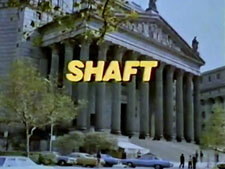 Shaft: Mystery and Suspense on Television. Richard Roundtree stars as private investigator John Shaft in this series that aired (with Hawkins) as part of The New CBS Tuesday Night Movies. It is based on a character featured in three theatrical films (Shaft, Shaft's Big Score!, and Shaft in Africa), also starring Roundtree. Only one season of 7 episodes was produced. Its companion series, Hawkins, was also canceled.